Good news for sausage fans; you no longer have to buy sausages from stores. This means no more concerns about meat quality and other unsavory ingredients associated with commercially prepared sausages. With homemade sausages, you get to choose your own ingredients and customize it to your specific taste. A sausage stuffer is one tool that makes this dream a reality by saving you a great deal of time and frustration. Sausage stuffers come in different types and sizes. You’ve got the small horn sausage stuffers, horizontal sausage stuffers, and vertical sausage stuffers. These come in different capacities of 3-5 pounds, 5-20 pounds and 5-15 pounds respectively. Apart from size and design, choosing the right sausage stuffer requires a further look into the features that count. For instance, you need to know that; stainless steel is ideal, air-release valves are a must, and two speeds are handier. Now that we’ve looked at the main consideration factors; what are the best sausage stuffers out there? Well, have a look at the list below and make your pick! This sausage stuffer comes in an all-metal stainless steel construction for optimized durability and easy cleaning. It works via a cranking mechanism and sports a solid gear system adjustable to two speed levels. The cylinder has a holding capacity of 7 pounds, a feature that makes it ideal for average sized batches. There are 4 stuffing tube sizes for sausage sizes of 2/3 inches, 5/8 inches, 1-1/4 inches, and 1-1/2 inches. The base of the stuffer is designed to easily mount on most surfaces for optimized stability. The construction of this sausage stuffer is quite rugged. It comes in a sanitary and easy to clean stainless steel cylinder. The frame comes in a heavy duty metal construction that keeps the stuffer from rocking. The cylinder tilts back for easy filling and has a capacity of 7 pounds. You get an air release valve that help keep the sausage casings air-free during the stuffing process. Stuffing tubes are made of plastic and come in 4 different sizes of 10mm, 20mm, 30mm, and 40mm. Quality and clean is the perfect way to describe this sausage stuffer. It comes in a stylish construction crafted from shiny and reflective stainless steel. This kitchen beauty operates through a hand cranking mechanism and comes with a removable cylinder for easy filling. The cylinder holds 5 pounds and you get the durability of all metal gears that make easy work of tough meats. Stuffing tubes are of plastic and come in 3 different sizes of 1/2 inch, 3/4 inch, and 1 inch. The stuffer includes two clamps that hold it securely in place. This vertical sausage stuffer has a stylish commercial-grade construction that complements any kitchen decor. The stuffer comes in stainless steel and holds up to 7 pounds. Easy filling is assured by a cylinder that tilts through 90 degrees. The base plate comes heavy to pin down the stuffer for maximum stability. This sausage stuffer cranks out meat in two different speeds for added convenience. You get 4 stainless steel stuffing tubes of 2/3 inch, 3/4 inch, 1-1/4 inch, and 1-1/2 inch. Those planning to make sausages in large batches might find this sausage stuffer a worthy option. The all metal stainless steel construction provides a built that can withstand any pressure subjected to it. 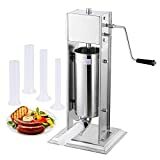 This sausage stuffer holds an impressive 11 pounds and has a cylinder that tilts to give you an easy time filling. You get to crank in two different speeds and a sturdy base holds everything secure to eliminate unnecessary movements. Stuffing tubes come in sizes of 2/3 inch, 3/4 inch, 1-1/4 inch, and 1-1/2 inch. This vertical sausage stuffer comes in premium grade stainless steel construction; a feature that makes it a stylish addition to your kitchen. The cranking handle is fitted with non-slip rubber to provide a comfortable hold. The gears are made of hardened steel and housed in a protective box for maximum durability. The cylinder holds 5 pounds and can be removed for easy filling. Stuffing tubes are of tough plastic sporting 3 different sizes of 1/2 inch, 3/4 inch, and 1 inch. Why grind and stuff meats in different appliances when you can use one? 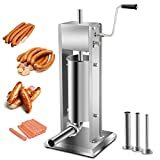 This sausage stuffer comes in a unique design that makes it possible to attach to a meat grinder. The stuffer employs the power of the motor to make the process a lot more easier. It comes with a mixer stand and is made of tough and sturdy plastic material. There are two stuffing tubes of 3/8 inch and 5/8 inch. This is a 7-pound sausage stuffer made of food-grade stainless steel. The frame is finished in a yellow painting to create a classic contrast that stands out in any kitchen setting. The stainless steel cylinder tilts for quick and easy filling. This stuffer cranks out the sausage in 4 different sizes of 10mm, 20mm, 30mm, and 40mm. The cranking handle is made of aluminum and sports a non-slip grip. 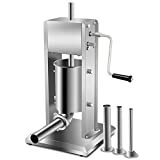 Making large batches of sausages is made easier with this large vertical stuffer. It holds 15 pounds of meat and stands stylish in a stainless steel cylinder and metal frame. The dual gear system gives you two different speeds to choose from. A tilting feature ideally positions the cylinder for easy filling. The piston is fitted with a release valve to let air escape. 4 plastic nozzles of 10mm, 20mm, 30mm, and 40mm diameter make it possible to prepare sausages of different sizes. This sausage stuffer is designed to hygienic standards and comes stylish in stainless steel. The cylinder sports a smooth and shiny look that makes cleaning quite a breeze. It accommodates up to 15 pounds of meat; a capacity ideal for large batches. 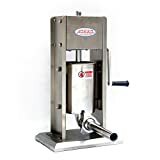 The cylinder removes easy for filling and can be fitted with 4 different plastic stuffing tubes of 2/3 inch, 3/4 inch, 1-1/4 inch, and 1-1/2 inch. There are two stuffing speeds to choose from and you get effortless cranking that doesn’t put much strain on your hand.